Premium Sequoia Sheds give you a truly beautiful and durable garden shed or storage building. They come caulked and painted with the shed and trim colors of your choice, and are built with the best quality components. Our 10-year warranty assures you of their optimum construction and durability. See this post on our craftsmanship for more details. Standard Sequoia Sheds offer a sturdy but basic storage shed for budget-conscious homeowners or do-it-yourselfers.The exterior is pre-primed but unpainted. The no-frills construction ensures lower costs while still giving you a storage solution. 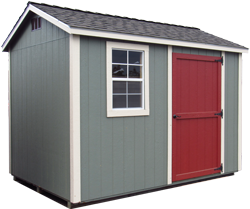 Standard sheds include a 1-year warranty. Our premium series shed warranty is simple, no-nonsense, and without fine print. We’ll repair or replace, free of charge, any components that do not provide reasonable service under normal use for a period of ten years from the date of delivery. Sequoia sheds are guaranteed to withstand wind, rain and snow—period. Sequoia sheds are built with quality materials. We use LP Smartside Siding and Trim, which comes with a 50-year warranty from the manufacturer. We use Pabco Premier Shingles, rated with a 40-year warranty. And our floor system is made of pressure-treated lumber. That is why we are able to offer a 10-year warranty on all our premium sheds. We build with genuine care and skill. We go to great pains to build a finished product that represents genuine, long-lasting quality. For instance, we caulk and seal the exterior of our painted Premium sheds, so no leaks happen. Our sheds aren’t slapped together or carelessly constructed. Sequoia sheds are designed with an eye toward both style and function. Our sheds look nice, with clean lines and careful paint jobs. Our doors are well over 6’ high, with higher ceilings, ensuring that users don’t need to duck or bend over inside. There’s plenty of room to stretch, and even better, plenty of room for storage. Sequoia sheds are locally built by local craftsmen. When you buy local from Sequoia, you are purchasing local product from local neighbors who live in and work in your neighborhood. Plus, most of our wood comes from the Shasta Green Mill in Burney, California. You might find a cheaper shed—at a box store, for instance. But you aren’t likely to find a better shed for cheaper. What more need we say? Each Sequoia shed can be customized to fit your dream or your property. 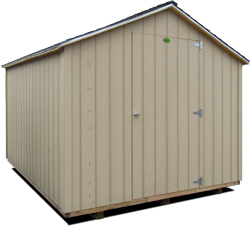 We can add custom options or alterations to any standard shed. Or we can start from scratch, working together on a shed that’s uniquely yours. Either way, you get your shed the way you want it. We offer free local delivery within 50 miles. For deliveries beyond Red Bluff and surrounding communities, contact us. Pilot car fees apply for certain sheds on certain routes.